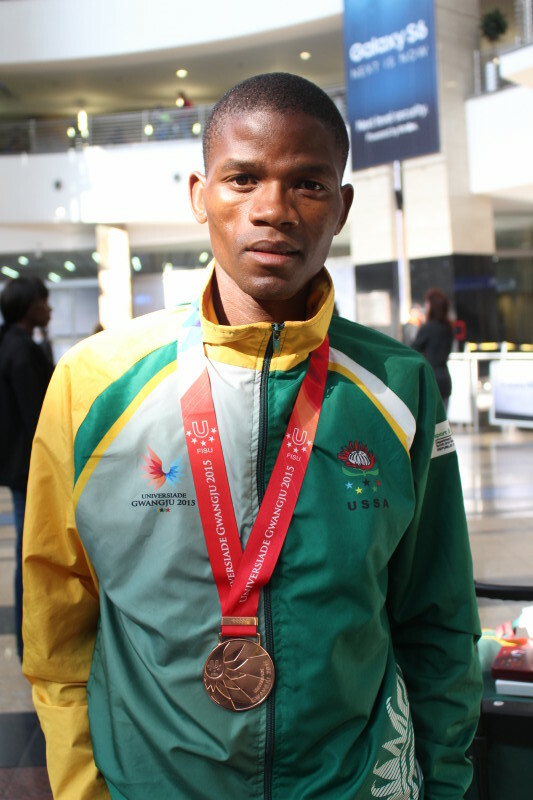 Mr Thabang Ambition Masihleho, a Marketing student from Welkom campus put Central University of Technology, Free State (CUT) on the map when he brought a bronze medal home from the 2015 Gwangju Summer Universiade (World University Games) held in South Korea recently. Universiade is a 12-day multi-sport event for global university students and this year, 170 countries participated. Thabang Masihlelo was one of the selected few to represent South Africa in South Korea from 3rd to 14th July 2015. He qualified for the competition during the USSA Track & Field Championships hosted at University of Stellenbosch in April this year with a qualifying time of 1:04:58.00. In the morning session of the 10th day of competition, the men’s half-marathon squad managed to secure a bronze medal in the team event, spearheaded by Thabang Masihlelo who finished eighth in the individual race, clocking 1:07:11.00 (finishing time). The national squad ended their competition with a total of five medals (two gold and three bronze), all achieved in athletics. Thabang Masihleho proudly displays his bronze medal.